Sometimes while riding and roaming like a nomad on a two wheeler, there’s a sudden itch to listen music just out of the blue. Now many of you might carry a Bluetooth speaker nowadays to quench your music thirst while on move but that’s not enough. Ever wondered of having a car like stereo system on your set of two wheels that would make long rides much more enjoyable. That’s exactly what we have brought you today in the form of a video. Let’s now take a look at the video before getting into the details. This nifty little audio kit is an excellent addition to any two wheeler, especially so if you like music. The overall unit consists of two small sized speakers along with one control module, which is almost the size on palm. It gets connected to the main battery onboard the vehicle so no more low battery issues as with typical Bluetooth speakers. The DIY kit also has some mounts and clips to hold things in place. The installation procedure is not much of a hassle and can be done either by you or any other local mechanic. 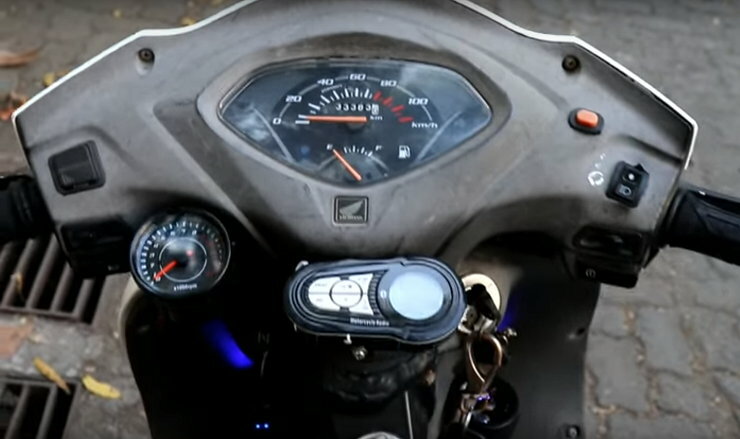 The video shows the control module being placed just below the instrument panel and the speakers down towards where the legs are placed on the Activa. With a little bit of work, including punching holes and installing mounts, the whole setup is complete and connected to the battery. Talking of features, This audio system offers Bluetooth connectivity, USB port and Micro SD card support. The control module has a small display which displays relevant information and a set of buttons for a variety of controls. These controls include volume up-volume down, equalizer, audio play/pause and telephony controls among others. Coming to the sound quality, the volume levels are good and the speakers give out a balanced sound. However, turning the volume to full or fiddling around much would lead to some extent of music distortion. The twin speakers look more cool in dark thanks to blue lightning they come equipped with. Overall, this audio system packs a decent punch and could make long highway journeys more enjoyable. The Honda Activa is India’s largest selling automatic scooter. It’s available in Activa-i, Activa 5G and Activa 125 trims. Engine capacity of the Activa ranges between 110cc and 125cc. Prices of the Honda Activa start from Rs. Rs. 51,000.